In Crew One Productions, Inc. v. NLRB, --- F.3d ---, Case No. 15–10429 (11th Cir. Feb. 3, 2016), the United States Court of Appeals for the Eleventh Circuit vacated a decision by the National Labor Relations Board (NLRB) and concluded that stagehands were not employees of Crew One, Inc. (stagehand referral service), but independent contractors. Crew One Productions, Inc. (Crew One) referred stagehands to event producers for concerts, plays, sporting events, trade shows and various other productions and events. Stagehands completed a questionnaire about their skills and availability to be included in Crew One’s database. After submission of the questionnaire the stagehands attended a brief orientation and received an information packet but no physical exam, testing or training. The information included client policies and best practices, as well as procedure for accepting or declining work offered. Additionally, stagehands signed Independent Contractor Agreements with Crew One, completed a W-9 and provided their own tools and supplies. The stagehands reported exclusively to tour personnel except for reporting with Crew One to record their attendance at the beginning and end of the event for payment purposes. At the request of clients Crew One maintained a workers’ compensation insurance policy, paid by clients. Crew One paid Stagehands on an hourly rate basis, provided no benefits or reimbursement for incidental expenses. In March 2014, the International Alliance of Theatrical Stage Employees (IATSE) petitioned the NLRB to represent stagehands who contracted with Crew One. The Board determined that the stagehands were employees of Crew One, directed an election and certified the union as the exclusive bargaining representative of the stagehands. After Crew One refused to negotiate with the union, the Board filed an unfair labor practice complaint. The Board entered summary judgment against Crew One, and the company appealed. 1. The regional director failed to establish that Crew One had the right to control the manner, means, and details of the stagehands’ work. The Court found that the actual work performed by the stagehands was controlled by the event producers. The requirement that the stagehands check in and check out with the Crew One supervisor at the beginning and at the end of the event, was solely for the purpose of calculating their hours worked and pay for the day, which did not evidence control of the means of work, only its end. The Court further found that stagehands had entrepreneurial interest because they were free to accept or reject work without retaliation and free to accept work from other labor providers. 2. The Board did not give enough weight to the fact that social security or income taxes were not withheld from Crew One’s payments to the stagehands. The Court noted the fact a company did not deduct social Security or incomes taxes from worker’s receipts was a strong indication of the absence of an employment status within the Eleventh Circuit, but acknowledged sister circuits would give this factor less weight. 3. The Court found the regional director incorrectly discounted the significance of the independent contractor agreement signed by each stagehand. The Court noted that absent evidence of fraud, duress, or some other defense to formation, the independent contractor agreement the stagehands executed with Crew One was evidence of the parties’ intent to create an independent contractor relationship. The Court also noted that the fact that Crew One required each stagehand to sign such an agreement was not a valid defense to the formation of the agreements. 4. The Board erred in considered bargaining power over pay as evidence of employee status. Under the common law, negotiation, or lack thereof, over pay is not a factor to be weighed in determining whether an individual is an employee or independent contractor. 5. The Board misapplied the law when it considered whether the stagehands performed essential functions of Crew One’s operations. According to the Court the relevant inquiry is “whether or not the work is a part of the regular business of the employer,” Restatement (Second) of Agency § 220(2)(h), not whether the work is essential to the business of Crew One. The Court found Crew One’s business was referring stagehands to event producers. It did not itself perform stagehand work. Therefore, stagehand work was not the “regular business” of Crew One which supported a finding of independent contractor status. 6. The Board’s findings of fact supported a finding that the parties intended to form an independent contractor relationship The Board found stagehands provided their own job supplies, received no benefits from Crew One and workers' compensation insurance was provided by Crew One at the behest of Crew One’s clients, with costs charged to the clients. 7. The Board correctly found that payment by the hour supported a determination of employee status. Considering all factors, the Court concluded the stagehands were independent contractors, not employees of Crew One. The Crew One, Inc. decision is a good reminder that the NLRB does not have the last word on labor law matters. 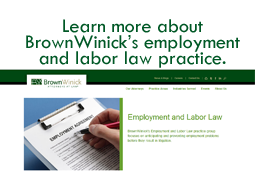 Should you have any questions about whether your workers are properly classified, contact your own legal counsel or any of our Employment & Labor Law Practice Group members.